Wi-Fi Protected Setup™(WPS) is a computing standard by the Wi-Fi Alliance which is designed to allow easier setup and configuration of wireless home networks. It automatically configures your wireless network name (SSID) and WPA security key as well as the WPS-enabled wireless devices in your home network. The Linksys Smart Wi-Fi Router (E4200 v2, EA2700, EA3500, EA4500 and EA6500) supports WPS, making it easy for you to connect your WPS-enabled wireless devices to the wireless network with a push of the button or by entering a PIN. Launch a web browser and access your Linksys Smart Wi-Fi Router’s user interface. To learn how, click here. NOTE: If you have enabled the local access interface, click here. Click the Device List Tool. On the upper-right side of the Device List page, click the Add a Device button. Select one (1) of the methods to connect via the WPS. You have the option to choose whether it is Push Button, Router PIN, or Device Pin. NOTE: Ensure that the Wi-Fi Protected Setup™ is set to ON. If not, click the toggle button to enable the Wi-Fi Protected Setup™ feature. • Push Button – click or press the WPS button on your device, and then click the WPS button on this page. • Router PIN – enter the number shown under Router PIN. NOTE: If you opt to use this feature, be sure to perform all of the steps immediately before the connection gets idle. You will need to start over if this happens. • Device PIN – enter the PIN number in the text box, and then click Register. QUICK TIP: To use this feature, you must know your device's WPS PIN. You can refer to the user manual for information about how to connect it through WPS. Once done, click the button. There will be a prompt that the changes are being applied. 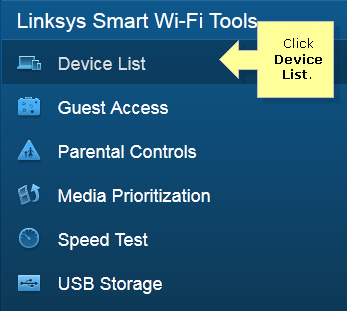 Click OK to go back to the Linksys Smart Wi-Fi Home. Click the Wi-Fi Protected Setup tab. • Device PIN – enter the PIN in the text box, and then click Register. 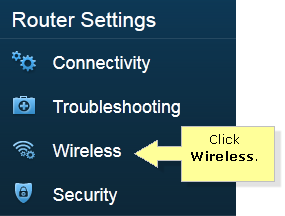 Your WPS-enabled device should now be connected to the wireless network. You can only connect one device at a time. You can also connect your Near Field Communications (NFC) compatible Android smartphones to your Linksys Smart Wi-Fi Router through the SimpleTap™ feature. Just tap the SimpleTap™ card to your smartphone to connect to the 2.4 GHz wireless network. To learn more about this feature, click here. NOTE: This feature is only available to the Linksys Smart Wi-Fi Router, EA6500.